Location: 13 Gilead Pl.,King St. E. and Parliament St.
Part of a newer complex designed by Brian Kucharski and developed by Gilead Investments, this three-storey freehold row house is located in Toronto’s Corktown neighbourhood, just south of King St. E., between Parliament St. and Sumach St.
“This is a haven of modern luxury, existing in a tiny alleyway in Corktown. Centrally situated, it is walking distance to the Distillery District, West Donlands — which is the site of the future Pan Am Village — and a 19-acre park called Corktown Commons. 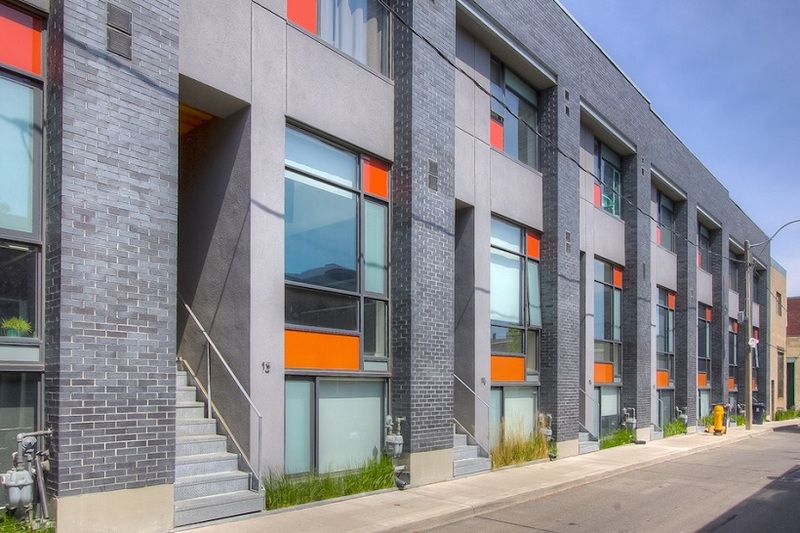 It is also close to the Financial District, Riverside and Leslieville,” says listing agent Robin Pope. “With about 1,800 square feet of living space, this contemporary loft-inspired multi-level townhouse features two bedrooms, a den, a family room, a studio, three bathrooms, soaring ceilings — some nine feet, some 10 feet and some as high as 14 feet — a gas fireplace and wide-plank hardwood flooring. The home has sweeping views of the city from the rooftop terrace and boasts a designer kitchen and master bedroom ensuite.